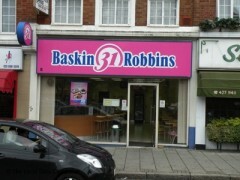 About: Baskin Robbins serve a wide range of ice cream in many different flavours. They also serve low fat and sugar free treats as well as a selection of Kosher dishes. Gift token are also available.